Sometimes I struggle to find a topic that neatly sums up what was happening on the ARIA chart in the late '80s or early '90s. 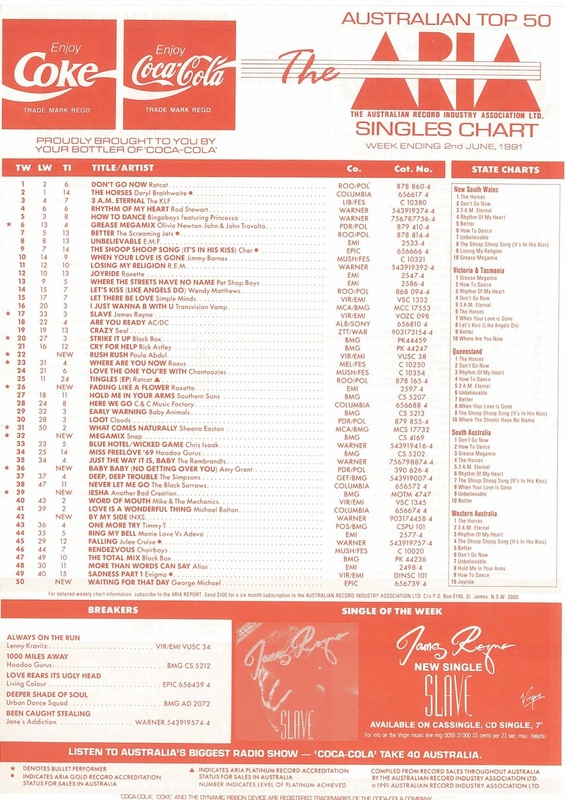 Then, there are weeks when I'm spoilt for choice - like with the top 50 from this week in 1991. Do I talk about how the week's highest new entry marked a major change in musical direction for the singer in question? Or discuss celebrity cameos in music videos? Or videos that reenact movies? Songs that got stuck at number 2? Or long-running American number 1s? All those topics relate to the one song - and I'll cover them all, as well as the week's six other debuts. There was a new number 1 in Australia this week in 1991 as "Don't Go Now" by Ratcat pushed "The Horses" aside to ascend to the top. It was Ratcat's second number 1 in a row, but "Don't Go Now" had reached its peak in just six weeks - a fraction of the time it took Tingles to do the same. I wasn't so keen on her debut solo single, but this follow-up, which was co-written by Cyndi Lauper, was an improvement - even if its chart position would suggest otherwise. It'd reached number 3 in late 1980, and the only instructional dance song I like (sorry, Bingoboys) was back in the chart as the stage show was being revived around the world. Poor Scritti Politti. "Wood Beez..." aside, they never had the Australian chart success they should've - not even with this pop/ragga cover of The Beatles B-side from 1964. This is what happens when you refuse to make proper music videos. Sure, "Praying For Time" had done well enough without one, but it was the lead single from an album. By single number three (number two in the UK), George needed a little something extra to keep people interested - something like a bunch of models, say. That was especially the case given "Waiting For That Day", while a nice enough song, didn't scream hit single - and had taken two months to drag its feet up to number 50 on the ARIA chart. The song, which borrowed so heavily from The Rolling Stones' "You Can't Always Get What You Want" that Mick Jagger and Keith Richards were listed as co-writers, progressed no further - and nothing else from Listen Without Prejudice Vol. 1 came anywhere near the top 50. The first three singles from X had given INXS diminishing charts returns, but the release of the album's big stirring ballad put a stop to that, with "By My Side" equalling the peak of second single "Disappear". The natural successor to "Never Tear Us Apart", "By My Side" has become the standout of the band's '90s output and would no doubt have been a much bigger hit if it hadn't been left until fourth. Earlier this year, we saw one of the African-American boy bands that'd stepped in to the gap left by the disbanded New Edition, and now we come to a group that actually had the endorsement of their predecessors. Six-piece Another Bad Creation were discovered and signed by New Edition's Michael Bivins (the Biv in Bell Biv DeVoe), who co-wrote this first single for the Atlanta youngsters. Now, I'm generally no fan of kids singing (unless it's as part of a choir after the key change of an '80s power ballad), but "Iesha" was hard not to like. From the swagger (before it was a thing) shown by the pre-teens in the music video to the catchy chorus of the new jack swing track, it was a brilliant debut that Another Bad Creation were never able to live up to. If you're wondering about the number of kids actually in ABC, there were the five members whose names you can hear chanted towards the end of the song - Chris, Mark, Red, David and RoRo - and unofficial member G.A., who skulks around a bit in the music video and appears on the cover of album Coolin' At The Playground Ya Know! She'd been testing the pop waters for some years, but Christian music star Amy Grant went fully mainstream with her eighth studio album, Heart In Motion - and landed her first ARIA top 50 hit as a result. Lead single "Baby Baby" also returned her to the US number 1 spot, but this time on her own, having previously reached the top with Peter Cetera on "The Next Time I Fall" in 1986. Although it was a secular song, "Baby Baby" wasn't exactly controversial - a cute ditty inspired by Amy's then-six-week-old daughter, Millie (who she brought onstage at the 1992 Grammys) - but her musical move was still enough to alienate some of her more devout fans. Enough remained for Heart In Motion to give Amy yet another number 1 (her eighth) on Billboard's Christian Albums chart. 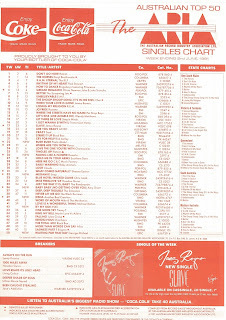 The song is named on the ARIA chart as "Baby Baby (No Getting Over You)", but that subtitle is actually the name of the main single mix not part of the title itself. The version in the music video below is actually the album version, which I prefer. Amy released yet another take on the song earlier this year, when she collaborated with Tori Kelly on a remix of "Baby Baby" to coincide with its 25th anniversary. Number 32 "Megamix" by Snap! Well, I guess they were due one. After four hit singles, German dance act Snap! released their obligatory megamix comprising, in order of appearance, "Ooops Up", "The Power", "Cult Of Snap" and "Mary Had A Little Boy". Like the identically titled release by Technotronic, "Megamix" actually works as a song in its own right, with good segues and, unlike certain other medleys (cough Black Box cough), no indication that this had just been hastily thrown together. There really was no stopping Roxette as the Swedish duo racked up their seventh consecutive top 10 hit in Australia - and did so with what was, as far as I was concerned, their best single yet. The second release from Joyride, "Fading Like A Flower..." was a mid-tempo number that combined the drama of Roxette ballads like "Listen To Your Heart" and "It Must Have Been Love" with the oomph of their more energetic hits - the best of both worlds really. What no one knew, though, was that this would also be Roxette's final top 10 hit in Australia. They enjoyed continued success for the next few years, but not at this level. Things were worse in America. After reaching either number 1 or number 2 with all of their singles except for "Dressed For Success" (but including this one), Roxette never saw the inside of the US top 30 again. She'd spent the better part of three years releasing (and often re-releasing) one pop/dance classic after another from her debut album, Forever Your Girl, but just when it seemed like Paula Abdul had found her niche, she went and defied expectations with this lead single from sophomore release Spellbound. Tender ballad "Rush Rush" sounded about as far removed from her previous efforts as it was possible to get without completely changing genre and she had the members of little-known R&B act The Family Stand to thank for the musical transformation. Paula collaborated on the majority of Spellbound with the group, who'd reached the UK top 10 with debut single "Ghetto Heaven" and were responsible for one of my favourite songs of 1991. Having worked with the top pop and R&B producers of the day on Forever Your Girl, the unexpected shift turned out superbly well. "Rush Rush" sounded fresh and different, and performed accordingly, speeding to number 2 on the ARIA chart, where it remained for three weeks stuck behind "The Grease Megamix". In the US, it became Paula's fifth number 1 hit and stayed there for five weeks - which was actually the longest stretch on top since late 1984 when Madonna managed six weeks with "Like A Virgin". Of course, a lot of the success of "Rush Rush" had to do with its cinematic music video, in which Paula and Keanu Reeves played the Natalie Wood/James Dean roles in an homage to Rebel Without A Cause. Keanu was on the cusp of becoming one of Hollywood's biggest new stars, having made a name for himself among teen fans thanks to the Bill & Ted films, and would soon be seen in Point Break and My Own Private Idaho. Choosing to cast him in her most ambitious music video to date was a genius move by Paula (or her team) and it ensured "Rush Rush" received even more attention that it already would have. Next week: thought there were a lot of new entries this week? Get set for nine debuts, including a future number 1 from a new soap star-turned-singer, the ultimate answering machine track, the single R.E.M. pretend doesn't exist, the Crowded House song I pretend doesn't exist and more. I've got a better copy of the 'Unconditional Love' video, but didn't upload it as 'My Side...' was blocked. I liked the song, but preferred the previous one. I never knew (or had forgotten) that 'The Time Warp' re-charted in 1991. I'm surprised there wasn't a Rocky Horror Show Megamix. Don't think I heard the Scritti Politti track at the time. 'Waiting For that Day' was pleasant, but a bit boring. I wonder how they coaxed him into making this 'video', given that he was adamantly against them for this era? If I remember correctly, it was just a performance filmed for a promotional video release (electronic press kit?) for the album in the US. I see the video you've embedded is ripped from an Australian promo VHS series, 'Showbiz'. Maybe it was an Australian-only 'video' - given that it looks a bit spliced-together, and doesn't appear on his DVD of music videos. I've got a copy from rage, but not from any other source. 'By My Side' would be my favourite or second favourite INXS song (with 'Original Sin' being the other). Though I wish it was longer/had another chorus section at the end. But I guess it's better to be left wanting more than outstaying its welcome (as 'Original Sin' does a bit for me during the outro). 'Never Tear Us Apart' was way too overplayed for me; this is the better ballad by far. As a 12 year old in the early 90's, I loved that 'Iesha' name-checked Nintendo. The chorus still holds up, I think, but the high-pitched voice is a bit off-putting. I hated 'Baby Baby' at the time, finding it too twee, safe and dated-sounding; but it's grown on me over the years, and I liked the subsequent singles from the album much more. Snap! 's was my favourite of the megamixes out around this time. I liked how it sped up at the end when segueing into 'Mary Had a Little Boy'. 'Fading Like a Flower' was one of my favourite Roxette songs. I thought it would have done better than #7, and yes, I wouldn't have picked that this would be their last local top 10 hit. I liked 'Rush Rush' a lot back then, but it hasn't really held up that well IMO. It was a bold move to release a ballad as the lead single from an artist known primarily for their dancing ability. Although there was a progression in sound, I never found the 'Spellbound' album as good as 'Forever Your Girl'. "Unconditional Love" was actually a cover version. Cyndi Lauper recorded it first, for her "A Night To Remember" album back in 1989. Susanna then released her own version in 1991.